A pencil sketch I drew last night. It's Howard the Duck and his arch-nemesis, Dr. Bong! 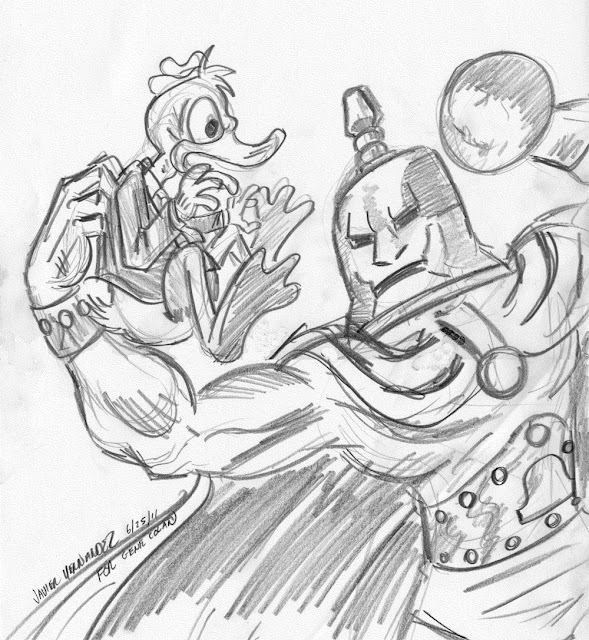 Done in tribute to Gene Colan, artist on the HOWARD THE DUCK comic book series. Gene Colan passed away on Thursday, and I wrote a personal recollection about him and his amazing career in comics on my blog yesterday. 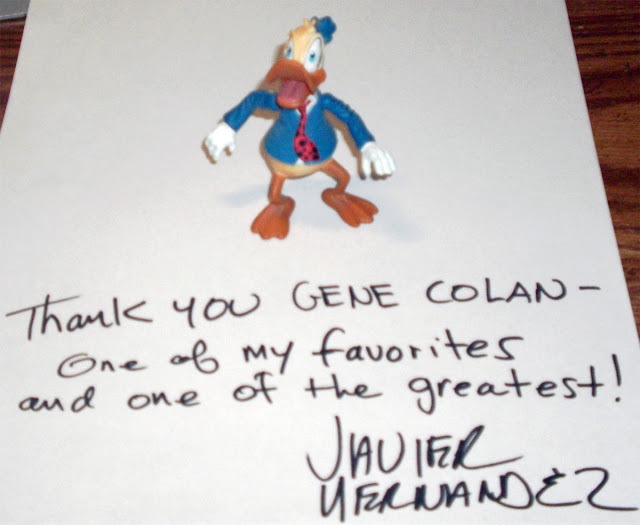 Howard the Duck was created by writer Steve Gerber, and artist Val Mayerick, when they introduced him in the pages of MAN-THING. 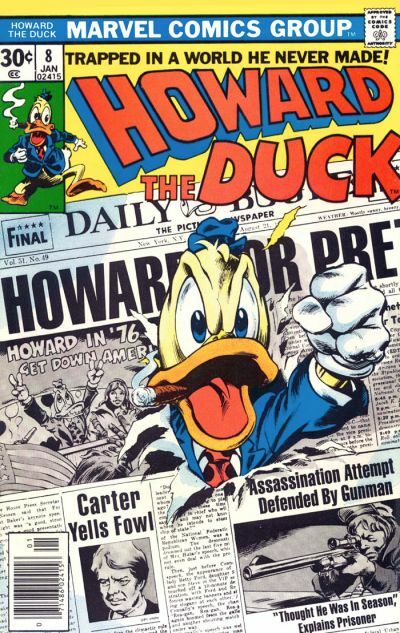 Soon Howard got his own comic book series and by the fourth issue the art chores were taken over by Gene Colan, who really made the character his own. Dr. Bong appeared in issue #15, co-created by Gerber and Colan. Gene Colan passed on June 23, having been in the hospital for various, long-term health issues. He was 84. When I started reading my first batch of comics, Gene's work was amongst the pile of books my older brother Albert had given me. 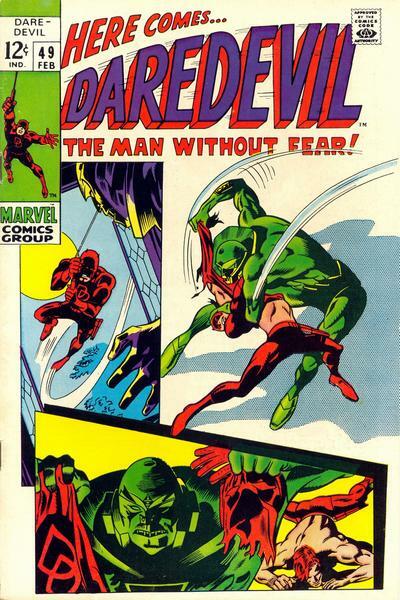 Included in that collection (dating from about 1968-70) were several titles drawn by Gene Colan, including DAREDEVIL, CAPTAIN AMERICA and IRON MAN. 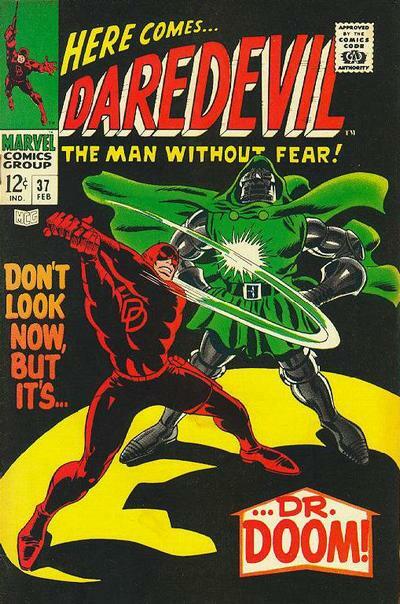 I love that two-fisted punch Daredevil's throwing on Dr. Doom! This issue stood out to me for the fight scene. Daredevil returns to his home, and there's a robot waiting for him in the closet. 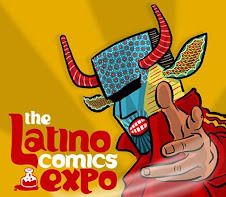 Daredevil approaches the closet door and the robot bursts out and demolishes DD. I mean he just wails into him and pounds him to a pulp! The robot takes his mask and shirt back to the villian's hideout as proof that he's destroyed Daredevil. The cover for this issue was a really clever way to preview the fight scene. By 1975, I was buying my own comic books off the shelves at 7-11, King Cole Market, McCoy's Market and anywhere else I could find them. For 25¢ a copy, it was a pretty sweet deal for a kid with a buck or two from mom! 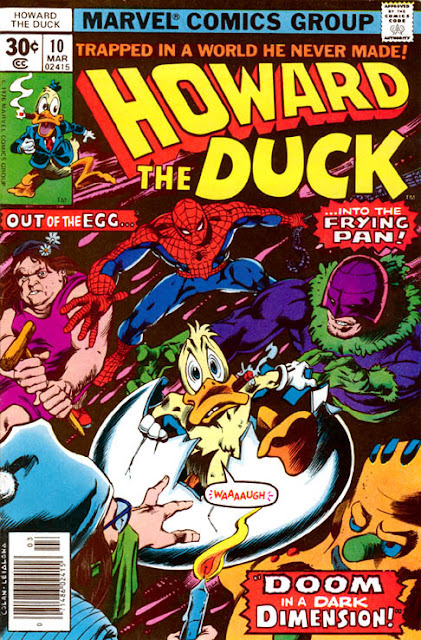 Besides all the superhero titles I was buying from Marvel (SPIDER-MAN, FANTASTIC FOUR, HULK, CAPTAIN AMERICA) I picked up, with much curiosity, HOWARD THE DUCK, written by Steve Gerber and illustrated masterfully by Gene Colan. Howard fights the Kidney Lady on a bus bound for Cleveland!! How's that for a teaser of a cover...? As a kid, some of Gerber's writing may have been above my head, but Gene Colan's artwork had my eyes glued to the page. At the time I'm sure I didn't appreciate the fact that he could draw spandex-clad superheroes as easily as he could a talking duck. But as I grew older I realized just how talented Colan was to be able to so deftly imbue Howard with as many personal attributes as he did. Just look at that image of Howard waddling down the aisle, angry determination on his face. Again, look at that angry indignation on Howard's face. He get's drafted to run for President of the USA by the All Night Party, and it looks like he's mad as hell and isn't going to take it any longer! Colan's great skill in displaying so much real emotion on a cartoon animal, combined with his naturalistic drawing abilities, gave HOWARD so much humanity. 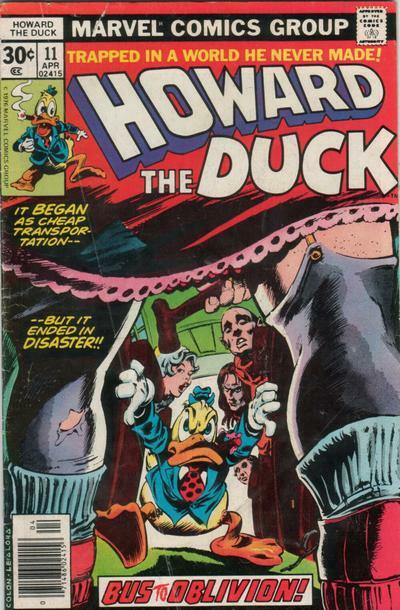 And of course with writer/creator Steve Gerber using Howard as a great sounding board for his own outsider sensibilities, it made for such a memorable book. Working with writer Marv Wolfman, (himself achieving a high watermark on this series), Colan imbued the lead character, a cunning monster in human form, with all the dignity, malevolence and high drama he could. 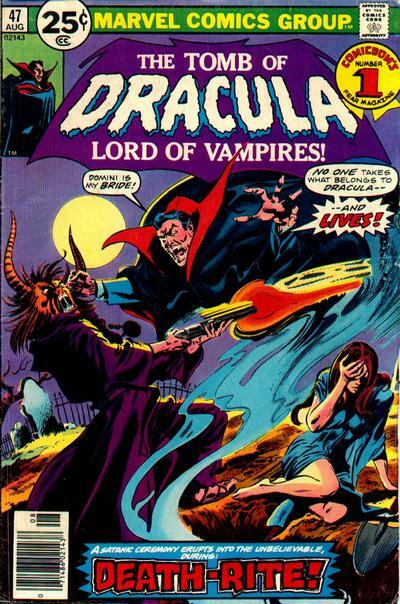 Dracula's series took the immortal character to entirely new levels, sometimes even clashing with such Marvel heroes as Dr. Strange and the Silver Surfer. 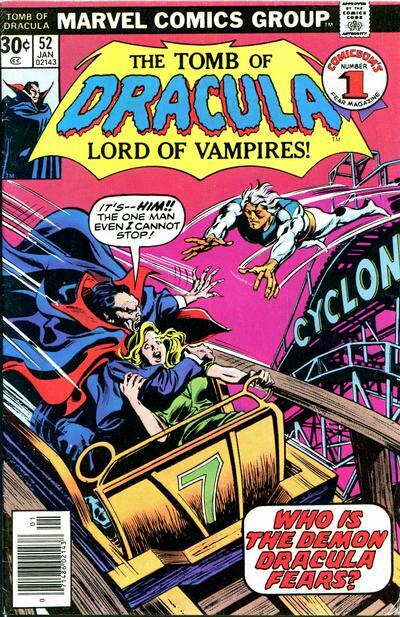 Colan's Dracula was all swirling capes and smokey mists. Like a ghost trying to live amongst humans. 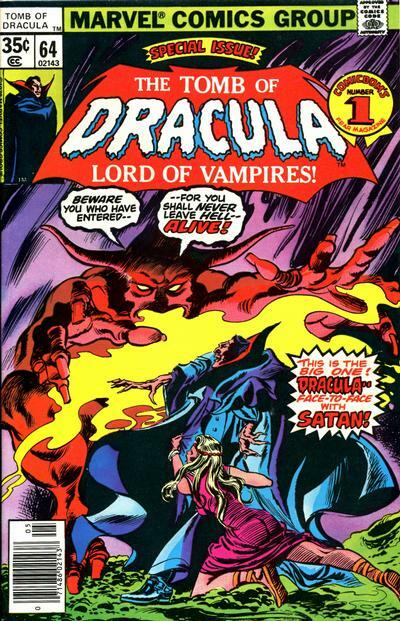 The scripts called upon Colan to conjure up haunted houses, nighttime cityscapes, demonic horrors and a grand design for Dracula, the proud Prince of Darkness, former king and corrupter of souls. All of which Colan handled with masterly skills. Credit must be given also to Tom Palmer, who inked Colan's painterly pencils with such precise attention. 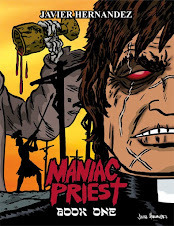 In the last two years or so the book's run, Wolfman introduced an epic story involving Dracula's takeover of a Satanic cult, his subsequent affair and marriage to a cult member, the birth of his child Janus, battles with Christ and eventually the Devil himself. Gene Colan of course presented the storyline with all the skills at his command: suspense, haunting atmosphere, horrific scenes of terror, melancholy, action. Above all, a passion for storytelling, moving the story forward with maximum dramatic effect. 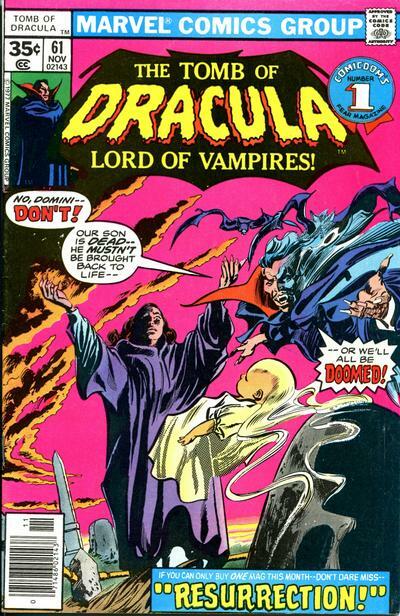 No stone was left unturned in the unspooling of this supernatural odyssey they took Dracula on. I bought most of this run at a used bookstore in Uptown Whittier called Ames Books, and remember being totally enthralled at the entire opus. To this day it remains one of my favorite stories ever told. 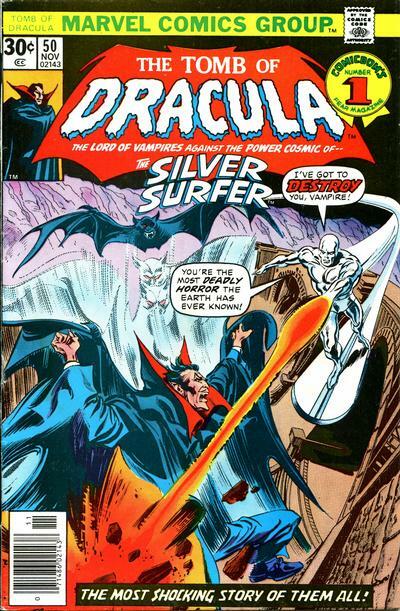 When Dracula met the Silver Surfer, it was truly two worlds clashing head-on. Dracula was an evil, supernatural enemy, all smokey mist and billowing cape, shrouded in black. The Surfer was a space-born hero created by alien super science, a pure soul, gleaming in metallic light. How perfectly Gene captured that confrontation on his cover. 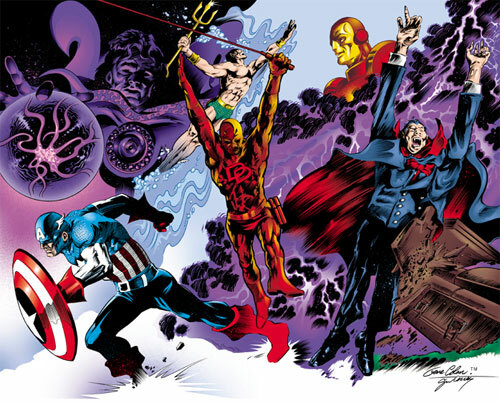 Gene Colan's career spanned about 7 decades. 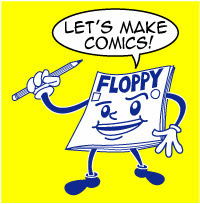 Almost 70 years drawing comic books. 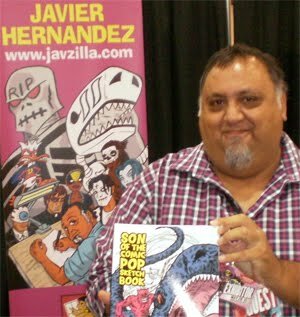 His strengths to me were his unmistakeable style of drawing, his flair for dramatic camera angles, his sense of movement in his figures, and that overriding sense he gave to all his characters of being alive, whether they were aliens, robots, undead monsters or talking ducks from Cleveland. Growing up with comics, taking them to heart as much as I did, makes me sad to hear of the man's passing. I never had the privilege of meeting Gene Colan, but feel so fortunate to have known so much of his work. His dedication to his craft, and his joy at doing what he loved, will always provide me with warm memories. And of course, I have so much of my favorite works of his at hand. Thank you, Gene Colan. You can read a quick obituary about Gene Colan over at writer Mark Evanier's site. Gene's close friend, Clifford Meth, who has been handling Gene's affairs since Gene's wife Adrienne passed away a year ago, has a very lovely final interview with Gene done just a few weeks ago, at his hospice bedside.